I really wanted to finish the Tavern Blues quilt in January, but my motivation flagged when I discovered I didn't have enough fabric for the borders. Last week, I bit the bullet and cut and pieced the border strips together. The fabric didn't cooperate well with my efforts to piece it, but I decided it was good enough and probably wouldn't be that visible when the top was quilted. As I've mentioned before, this quilt is a beast (96 inches square) and I don't have a large enough area to hang the quilt to get a good photo. I had to move the kitchen table out of the way to even measure the final borders. 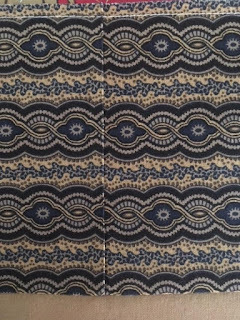 Because I was short of border fabric, I could not miter the corners, so I added cornerstones, using the same fabric as the sashing cornerstones. 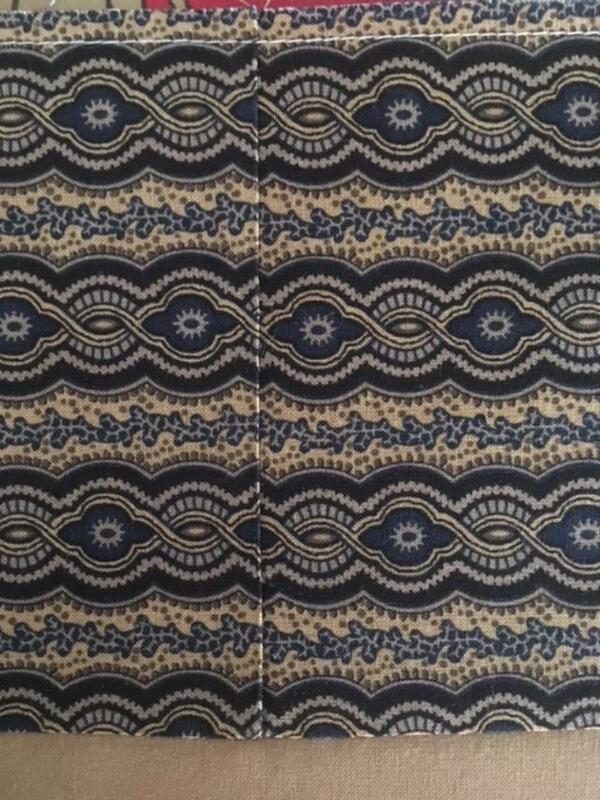 The backing is made, and the quilt is ready to take to the longarmer for quilting. 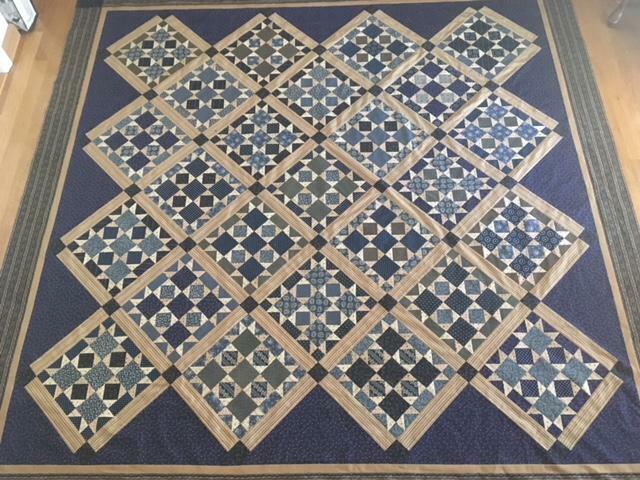 I am thrilled to have this quilt top finished. I'll share a better photo of the whole quilt when it is quilted and bound. 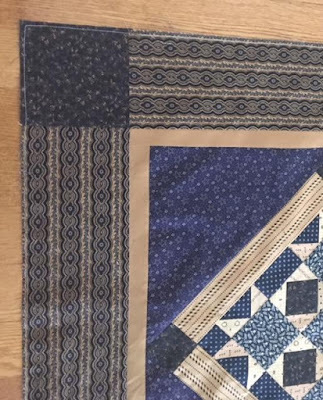 Tavern Blues is a Civil War inspired pattern by Bonnie Blue Quilts and designed by Paula Barnes. At the age of 17, Mary Elizabeth Jenkins married John Harrison Surratt, a 28 year old farmer and land holder. They had three children together. In 1851 the home they lived in burned to the ground. John purchased 200 acres in what is now known as Clinton, Maryland and built a new home and tavern. Surratt Tavern was also a post office, a safe house for the Confederate underground, a polling place, and an inn. Over the years, John Surratt became an alcoholic and was reportedly both mentally and physically abusive to Mary. After his sudden death of a stroke in 1862, Mary was forced to sell off land to pay off her husband's debts. She moved into a townhouse her husband had purchased earlier in Washington, D.C., and she rented the tavern to an ex-policeman, John Lloyd, who would later testify against her in the conspiracy trial of Lincoln's assassination. Mary turned the townhouse into a boarding house, and it was there that Mary's son John Surratt Jr., a Confederate spy during the war, introduced her to John Wilkes Booth and other conspirators. Mary Surratt and three other conspirators were tried and found guilty in the assassination plot of President Lincoln and as a result were sentenced to death. On July 7, 1865 they were sent to the gallows and hung, making Mary Surratt the first woman to be executed by the United States government. I think it looks great, and I agree that the piecing won't be all that visible once it is quilted. Congratulations on another finish! Interesting story. I remember reading about her when I read "Killing Lincoln." Hey, that's not too far from where I live! I took mom to visit the little museum there years ago. On a side note, I am the direct descendant of the first man to ever be executed for treason in the new land for supposedly being a Spanish spy. Not exactly a claim to fame! The border 'problem' was solved perfectly! You can be very proud of this accomplishment! Thanks for the history lesson-the quilt is a great reminder of that time for our country! The quilt is gorgeous!! I like the cornerstones in the border. And what a fascinating story. The quilt is beautiful! and like Sara, I like the cornerstones. Well, THAT one certainly gave you problems, but it turned out beautiful. Pretty quilt, but a sad story! Oh my goodness, that's a sad story. Wow. I love the color blue, so despite the inspiration, and sad story, something beautiful came of it. A great quilt and a great story too!! I never knew how Mary Surratt came to be involved in the Lincoln assassination. Thanks for the history info. Your piecing is near perfect! That quilt isn’t absolutely amazing. You solved the corner problem very beautifully. That story was incredible and new to me. And here I thought I knew my history! What a perfect finish! I love it. What a grand quilt. Thank you for sharing the story. The cornerstones a clever idea. I sometimes stitch cornerstones into border so I don’t have to turn the pattern around the corner. 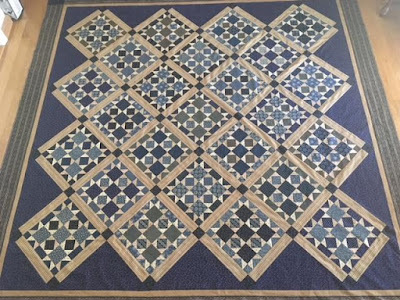 Oh my goodness what a beautiful quilt and very fascinating story! If you are going to ask a question make sure you have your profile set to allow me to respond back by email or email me directly - my address is in upper right hand column.